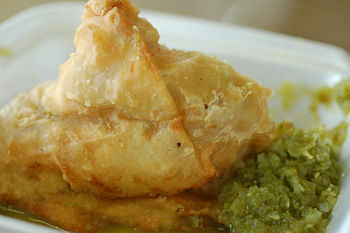 Samosa, or singara is a preparation of processed potatoes (occasionally along with cauliflower) that have been put inside a near-pyramidal shaped covering of flour dough and deep-fried. This is a typically north Indian food. However, in south India a similar thing is available but containing carrots and onions in place of potatoes. In Eastern Africa, variants called samusa, samousa and samosa appeared thanks to East Asian immigration and cultural exchange. In Uganda, for example, samusas are so ubiquitous they are thought of as a native snack. Ugandan samusas are flatter with a browner, less puffy pastry than Indian ones, a ground beef variant is seen more often than the vegetarian one and the main herb tasted is coriander. Kenya, Tanzania, Somalia and Ethiopia all have samosa variants. Initially the potatoes are cut into small pieces and cooked with ginger, garlic, onion, varieties of nuts, raisins, turmeric, salt, and, occasionally cauliflower in a small amount of water. The covering dough is prepared with flour, water, oil and salt. Some cooks add ajowan, black cummin seeds or fennel seeds to the dough. The cooked potato preparation is put inside the dough, which is flattened to an ellipse of about 15 cm by 8 cm diameter and cut into half. Most cooks cook them during a single immersion in a generous amount of oil pre-heated to a temperature around 375°F (190°C) until they are golden and slightly crisp. This page was last modified 13:51, 8 June 2009.